When I a little girl my mom used to let me watch Sesame Street on PBS. Immediately following the kiddie show equated with parental freedom Julia Child's cooking show, The French Chef came on. I don't vividly remember watching her show, but my mom has told me she used to find me glued to the cooking program and laughing my head off every time Julia Child spoke. When I was in culinary school I attended a required class called Garde Manger. Developing the skills of a pantry chef involved many techniques, but the most daunting by far was egg cookery. In fact the 100 pleats in a Toque Blanche (white hat) represent the number of ways a chef should know how to cook an egg. Over easy proved to be the most challenging cooking method, as we were expected to cook the egg sunny side up (without a hint of browning on the edges) and fluidly flip the eggs in the pan keeping the yolks in tact. Two eggs, one flip, one slide onto a plate, one grade...pass or fail. I was terribly nervous and feeling the pressure of the exam so I bought three dozen eggs and practiced at home. I was a woman obsessed with perfection and trying not to waste the eggs. I kept handing plate after plate of eggs to Leif to eat while I practiced. Finally he looked at me and said, "Mel I just can't eat your mistakes anymore." I passed and thankfully Leif did not have a heart attack. 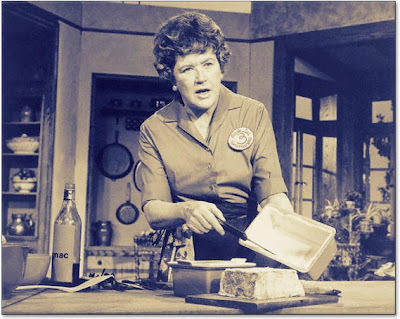 I am hosting a birthday party for Julia Child on August 15th and our guests are required to bring a dish from Mastering the Art of French Cooking no matter how it turns out. I cannot remember the last time I saw a movie on the day it came out without my kids. Tonight Leif and I went to the Marion Street Cheese Market for a glass of wine and a nosh before taking in the new Movie Julie and Julia at the Lake. It was splendid enjoying a much needed date with my husband and the movie exceeded all the hype! Watching Julie poach her first egg and Julia chop a mountain of onions to build speed for her classes at Le Cordon Bleu brought back memories of stuffing Leif with cholesterol to pass my egg cookery exam. The incredible Meryl Streep portraying Julia Child made me laugh each and every time she opened her mouth just as the real Julia did after I watched Sesame Street. The complicated dishes cooked on the big screen tonight made me look more and more forward to our birthday celebration for Julia! Like an egg is the perfect food, this was a perfect evening.